NOW, a Straw Making Machine that delivers all the levels of quality and reliability that you deserve. Enjoy all new levels of straw production performance with the JS 284-S/3V. This PP Straw Making machine from JUMBO STEEL achieves the highest levels of productivity and performance through its superior construction. It has been specially designed and engineered to combine many fine features in a single unit. Model : JS 284/VL series & JS 285/VL series. Ball pen re-fill making machine. Model : JS 284/RF series. 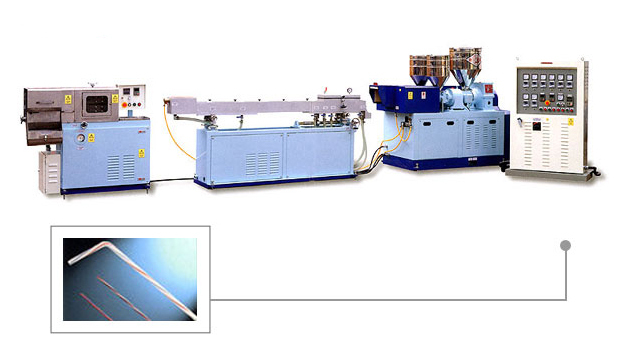 Cotton bud stick making machine. Model : JS 284/CB series. and straight endstraws, cutting one piece at a time. The screw, manufactured from Aluminum Chromolybdenum alloy steel(SACMI), is stress relieved, precision ground and nitride treated for a long service life. The barrel, manufactured from Aluminum Chromolybdenum alloy steel(SACMI), is stress relieved precision ground and nitride treated for a long service life. The stainless steel (S410) die undergoes nitride hardening treatment for a long service life. The water stirage tank is power adjusted transversely and manually adjusted vertically to ensure convenient take-up and die-change. 800-1200 pcs/min for 120mm sharp end straws. Variable straw length, 100mm-300mm, can be easily adjusted when the machine is running. The belt type take-up unit ensures and even stabilizing speed and prevents straw slippage during take-up operations. panel for maximum convenience of operation. - Amp meter-indicating the screw load. and straight end straws, cutting one piece at a time. A cutting cotton rod is available upon request.